What is Playground Mode in Fortnite? Learn everything you need to know about Fortnite’s limited-time event, Playground Mode. Get ready to spend a lot more time in the fantastic world of Fortnite thanks to a new limited-time event, Playground Mode! For those that are new to the game, it’s only natural to ask the question, what is Playground Mode in Fortnite? Playground Mode is a limited-time event that has recently been added to Fortnite after a few technical hiccups. 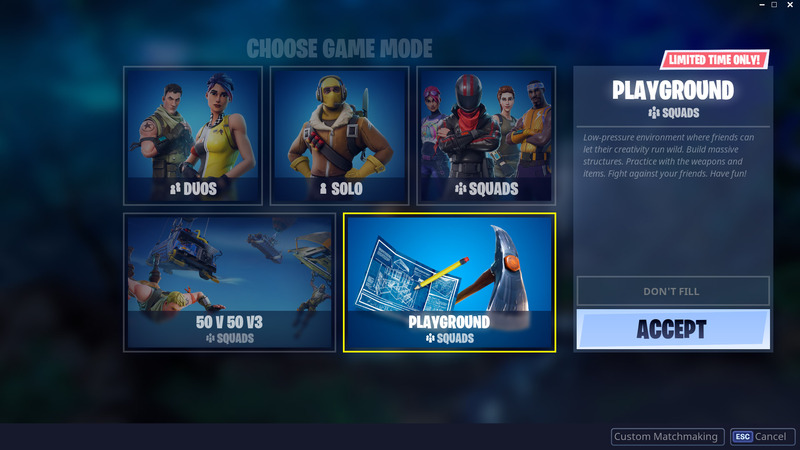 Playground Mode lets players group up with three other friends (or go in solo) and experience the battle royale map with almost no restrictions. Players are dropped into the map to harvest materials, build outrageous creations, search for chests and llamas, and just enjoy the sights and sounds. While a normal game of Fortnite: Battle Royale is limited by the ever-encroaching storm, the Playground Mode has a significantly longer time limit, giving players one hour to play around. This is perfect for players who are just getting on the fun bus that is Fortnite, as it gives them an opportunity to explore and become familiar with the vast and winding map. Arguably the most important aspect of Playground Mode is that it gives players a large space to create all sorts of wonderful contraptions. Whether someone is a humble builder just starting out and trying to learn how to switch material types or a pro who can construct a base in a blink of an eye, Playground is the ideal practicing spot for all players. Playground Mode (in its current state) is only around until July 12, so get in as much playtime as possible before it disappears once more. Thankfully, while it will be taken away, Epic Games will be bringing it back in the near future.